Recent advancements in synthetic biology have enabled the creation of genetically modified microorganism with over-express activities for the synthesis of specific PHAs in high-yields.19–22 Since then, a number of industrial plants for the production of PHAs have been commissioned in the USA, Italy, Brazil, and China.7,14,23,24 However, the production cost of PHAs is nearly four times larger than its petroleum-based counterparts (c.a. PHAs25 and Polypropylene26 prices are 5-6 and 1-2 $/Kg, respectively). This is due to high raw materials costs, complex purification of the fermentation broth, large amounts of biomass waste generated (c.a. 5 kg of raw material per 1 kg of product), and low conversion rates.27 Catalytic chemical conversion routes of biomass-derived feedstocks to short a-hydroxy acids (e.g. lactic acid) have shown higher productivities and atom-efficiency at industrially relevant operating conditions,28–31 but their application have not been widely used for the production of medium- and long-chain a-hydroxy acids and a,b-dihydroxy acids. Ethanol production from renewable resources accounts for more than 94% of the world’s biofuel production.32 However, ethanol has some disadvantages when used as a fuel in internal combustion engine, such as its lower energy density (30%) than gasoline, corrosiveness, low flame luminosity and hygroscopicity.33 Furthermore, limited compatibility with the existing infrastructure, and acceptable low level blends (< 15% ethanol) limit the growth of ethanol as a transportation fuel. Hence, research has mainly focused in the last years on the utilization of bioethanol as a commodity chemical.34–36 In this contribution, we report for the first time the feasibility of a process for the conversion of bioethanol into mono- and dihydroxy acid monomers of medium- and long- chain, via a heterogeneous catalytic route for the production of PHAs and other valuable monomers. To accomplish this, we have employed a catalytic cascade process involving: oxidative dehydrogenation, aldol-condensation, selective oxidation, Sharpless epoxidation,37 and hydrogenation (see Scheme 1). 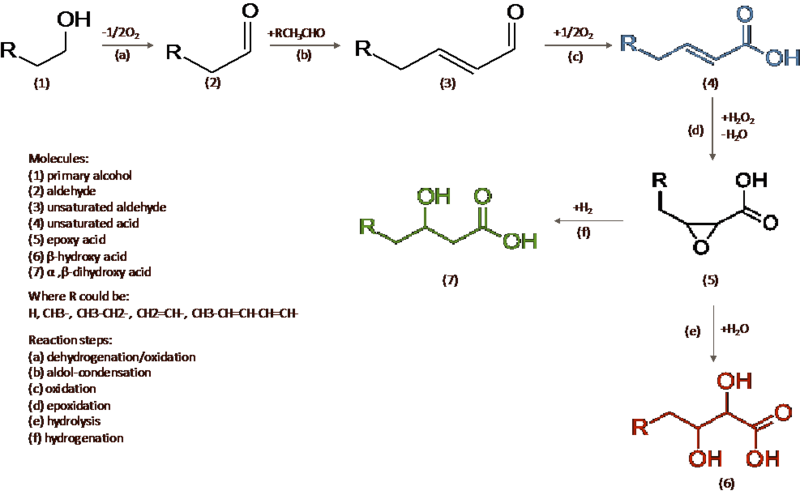 In this total reaction network, the most important steps are the aerial oxidation (c), epoxidation (d), and hydrolysis (e); while dehydrogenation of the ethanol to acetaldehyde (a), aldol-condensation (b), and hydrogenation reaction (f) can be accomplished easily with existing technology. The most crucial part is to develop efficient catalysts for optimal conversion in reactions b, c and d. Achieving high selectivity in these conversion steps is a major issue as over-oxidation and hydrolysis can lead to CO2 and other cracking products and decreasing the overall product yield and, in turn, process economics. 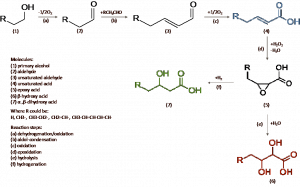 Scheme 1: Sequential reaction steps for the production of unsaturated and mono- and di-hydroxy acids from bioethanol. To this end, the conversion of ethanol to crotonaldehyde has been further investigated in previous studies of our group.38,39 In order to demonstrate the achievability of the overall ethanol to PHA precursors process, a series set of experiments will be performed employing heterogeneous catalysts for the most crucial step: oxidation of crotonaldehyde to crotonic acid. This process will be studied using a metal-supported catalyst based on Au and Pd alloys. (1) Plastics Europe. Plastic – the Facts 2016; 2016. (2) Iwata, T. Angewandte Chemie – International Edition. 2015, pp 3210–3215. (3) Rujnić-Sokele, M.; Pilipović, A. Waste Manag. Res. 2017, 35 (2), 132. (4) BritishPlasticsFederation “Oil consumption”. http://www.bpf.co.uk/press/Oil_Consumption.aspx. (5) Hopewell, J.; Dvorak, R.; Kosior, E. Philos. Trans. R. Soc. B Biol. Sci. 2009, 364 (1526), 2115. (6) Jambeck, J. R.; Geyer, R.; Wilcox, C.; Siegler, T. R.; Perryman, M.; Andrady, A.; Narayan, R.; Law, K. L. Science (80-. ). 2015, 347 (6223), 768. (7) Dietrich, K.; Dumont, M. J.; Del Rio, L. F.; Orsat, V. Sustain. Prod. Consum. 2017, 9, 58. (8) Lambert, S.; Wagner, M. Chem. Soc. Rev. 2017, 46 (August), 6855. (9) Lemoigne, M. Helv. Chim. Acta 1946, 29 (5), 1303. (10) Doudoroff, M.; Stanier, R. Y. Nature 1959, 183 (4673), 1440. (11) Williamson, D. H.; Wilkinson, J. F. J. Gen. Microbiol. 1958, 19 (1958), 198. (12) Macrae, R. M.; Wilkinson, J. F. J. Gen. Microbiol. 1958, 19 (1958), 210. (13) Pollet, E.; Avérous, L. In Biopolymers – New Materials for Sustainable Films and Coatings; Plackett, D., Ed. ; John Wiley & Sons: Chichester, 2011; pp 65–86. (14) DiGregorio, B. E. Chem. Biol. 2009, 16 (1), 1. (15) Steinbüchel, A.; Füchtenbusch, B. Trends in Biotechnology. 1998, pp 419–427. (16) Sudesh, K.; Abe, H.; Doi, Y. Prog. Polym. Sci. 2000, 25 (10), 1503. (17) Avérous, L. Handbook of Biopolymers and Biodegradable Plastics; 2013. (18) Lee, S. Y. Trends in Biotechnology. 1996, pp 431–438. (19) Byrom, D. In Plastic from Microbes: Microbial Synthesis of Polymers and Polymer Precursors; Mobley, D. P., Ed. ; Hanser: Munich, 1994; pp 5–33. (20) A. Steinbuchel. In Biomaterials, Novel Materials from Biological Sources; Byrom, D., Ed. ; Stockton: New York, 1991; pp 124–131. (21) Katoh, T., Yuguchi, D., Yoshii Haruki, S., & H. Shimizu, K. Journal of chemical technology and biotechnology. 1999, p 113. (22) Lambert, S.; Wagner, M. Chem. Soc. Rev. 2017, No. August. (23) Chen, G.-Q. In Plastics from Bacteria: Natural Functions and Applications; Chen, G. G.-Q., Ed. ; Springer Berlin Heidelberg: Berlin, Heidelberg, 2010; pp 121–132. (24) Chen, G.-Q. Chem. Soc. Rev. 2009, 38 (8), 2434. (25) Wolf, O.; Crank, M.; Patel, M.; Marscheider-Weideman, F.; Schleich, J.; Husing, B.; Angerer, G. Techno-economic feasibility of large-scale production of bio-based polymers in Europe; Spain, 2005. (26) ICIS. Indicative Chemical Prices A-Z https://www.icis.com/chemicals/propylene/ (accessed Jan 25, 2018). (27) Kootstra, M.; Elissen, H.; Huurman, S. PHA’s (Polyhydroxyalkanoates): General information on structure and raw materials for their production; Wageningen, 2017. (28) Wang, Y.; Deng, W.; Wang, B.; Zhang, Q.; Wan, X.; Tang, Z.; Wang, Y.; Zhu, C.; Cao, Z.; Wang, G.; Wan, H. Nat. Commun. 2013, 4 (Ii), 1. (29) Cho, H. J.; Chang, C.-C.; Fan, W. Green Chem. 2014, 16 (7), 3428. (30) Sharninghausen, L. S.; Campos, J.; Manas, M. G.; Crabtree, R. H. Nat. Commun. 2014, 5, 1. (31) Chen, L.; Ren, S.; Ye, X. P. Fuel Process. Technol. 2014, 120, 40. (32) Demirbas, A. R. Soc. os Chem. 2011, 5 (4), 29. (33) MacLean, H. L.; Lave, L. B. Prog. Energy Combust. Sci. 2003, 29 (1), 1. (34) Pham, T. N.; Zhang, L.; Shi, D.; Komarneni, M. R.; Ruiz, M. P.; Resasco, D. E.; Faria, J. ChemCatChem 2016, 8 (23). (35) Wang, Y.; Sun, J. ACS Catal. 2014, 4, 1078. (36) Falletta, E.; Rossi, M.; Teles, J. H.; Della Pina, C. Molecules 2016, 21 (3). (37) Hollingsworth, R. I. US 5292939 A. Process for the preparation of 3,4-dihydroxybutanoic acid and salts thereof, 1994. (38) Zhang, L.; Pham, T. N.; Faria, J.; Resasco, D. E. Appl. Catal. A Gen. 2015, 504, 119. (39) Zhang, L.; Pham, T. N.; Faria, J.; Santhanaraj, D.; Sooknoi, T.; Tan, Q.; Zhao, Z.; Resasco, D. E. ChemSusChem 2016, 9 (7).